We are delighted to announce we are collaborating with Axel Arts to present our first outdoor sculpture exhibition. A mixture of larger scale ceramics and sculpture suitable for outdoor siting will be exhibited on the hotel’s elegant patio, overlooking the canal and the city of Bath. The exhibition will take place over the first two weekends of May (4th – 7th May and 11th – 13th May 2018) and will coincide with the Badminton Horse Trials as well as the opening of Bath Festivals 2018. A few smaller, select pieces of sculpture including some painting and print will be showing indoors. Cream teas will be served on the croquet lawn or, depending on the weather, in the conservatory during the exhibition. The exhibition includes nine artists from emerging to established careers, working across a range of media to includes bronze, steel, concrete and ceramic. Exhibiting sculptors are Marc Bodie, Dorothy Brook, Ian Edwards, Rick Kirby, John Huggins RWA FRBS, Melissa Kiernan, Tamsyn Trevorrow. Ceramic artists exhibiting are Rhian Jones and Mick Morgan. Sculptor Marc Bodie, works in concrete and bronze, using his own body and face as reference for his larger than life busts. Bodie’s sculptures reflect the struggle and conflict of human suffering and fragility. Dorothy Brooks captures the grace and beauty of movement with a clear and bold line in bronze. 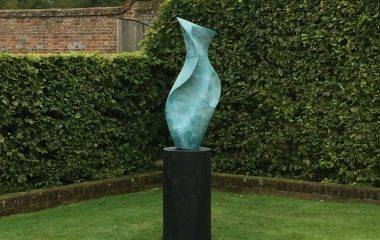 The inspirational sculpture of Ian Edwards depicts the strength and courage of endurance and achievement despite all, whilst the quiet presence of Rick Kirby’s statuesque steel sculptures offers a watchful comfort. John Huggins’ large scale bronze sculptures engage with a rich dialogue of historical and cultural reference, merging a timeless appreciation of form, storytelling and symbolism. Similarly, Melissa Kiernan’s delicate sculptures are hand built from porcelain and mine a rich vein of storytelling, the translucency of the clay poetically referencing the fragility, yet robustness of the human form. Cornish artist Tamsyn Trevorrow’s textural sculpture reflects the rhythmic, circular motion of the sea and its perpetual interaction with the land. Our two exhibiting ceramic artists work with a variety of techniques and processes, all vessels being suitable for siting outdoors. Emerging artist Rhian Jones smoke fires her hand-built vessels, repairing cracks and breaks using the ancient art of Japanese Kintsugi. Her pots reference ancient Egyptian burial rites and early bronze age Beaker pottery. Mick Morgan is an established ceramic artist based in Wales. His hand built, elegant stoneware vessels are inspired by the female form.